Maybe it’s just me, but I use butternut squash primarily for sweets. Yes, from time to time, a savory preparation is in order but when the first of the butternut squash materialize in the fall, all I can think about is pie, or cupcakes, or tarts. But then I thought, what about brownies? In perusing the interwebs for brownie recipes involving this tasty squash, I became bombarded by so-called “healthy” brownies labeled as such because the squash was a replacement for the butter or eggs or even sugar, which is just plain ludicrous. Who would EVER replace butter or eggs with squash? Probably the same people who buy avocado slicers, stand in the express line with 45 items and think Donald Trump is a respectable businessman. 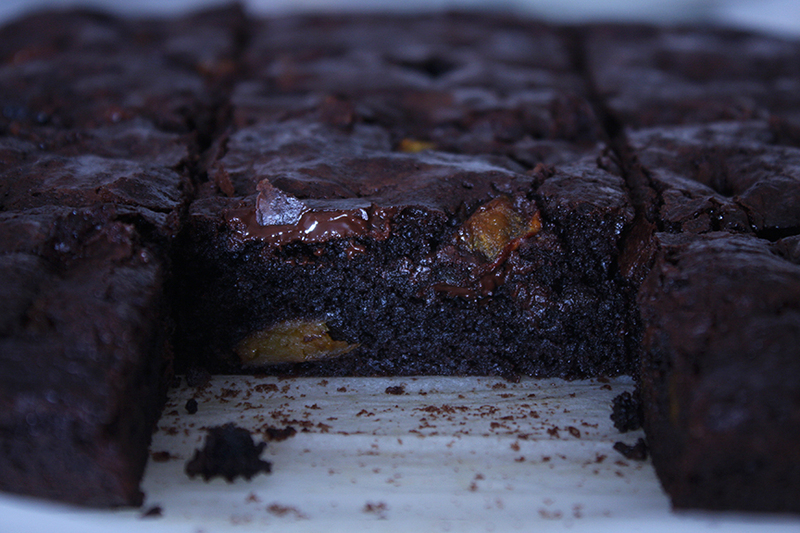 “I need to lose weight so I’ll start making brownies with squash” said no one ever. 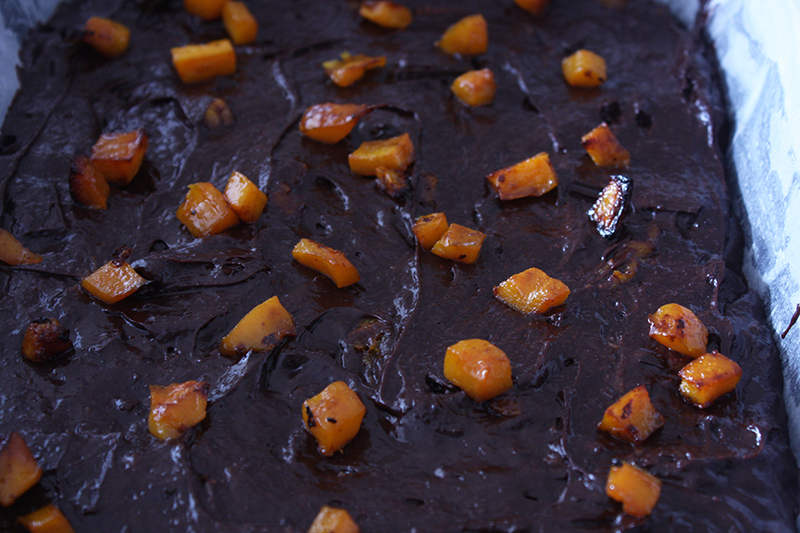 Well I do like to put butternut squash in my brownies. Not as a substitute and not to meet some delusional idea that it will make them healthy. 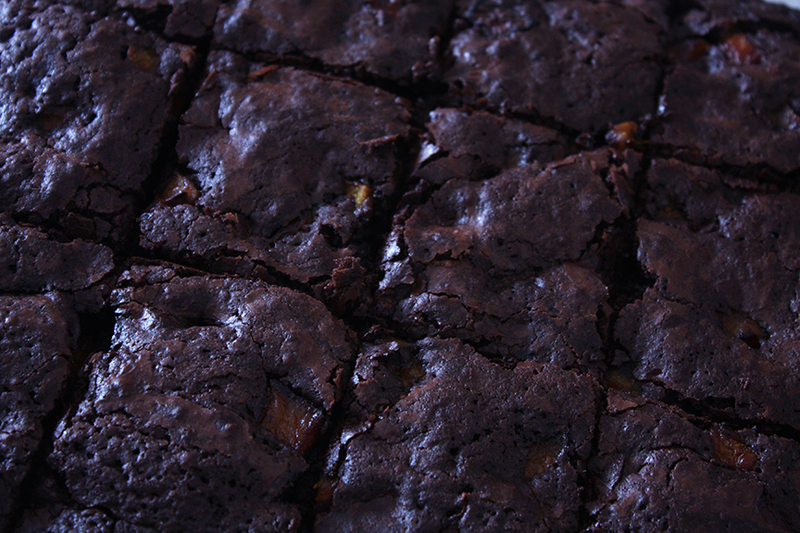 Cause honestly, healthy brownies sound supremely unpleasant and are frankly a tremendous waste of time and calories. 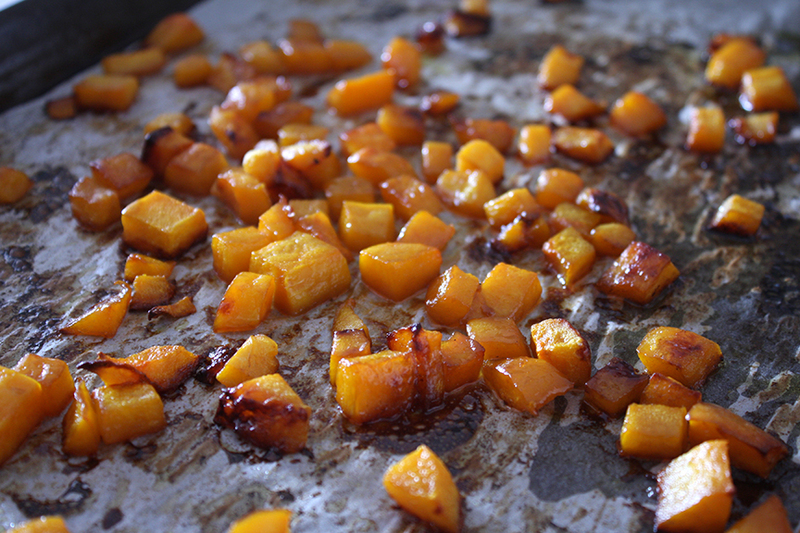 Instead, my squash gets doused in butter, sprinkled with brown sugar and roasted until caramelized. I’m not playing around. 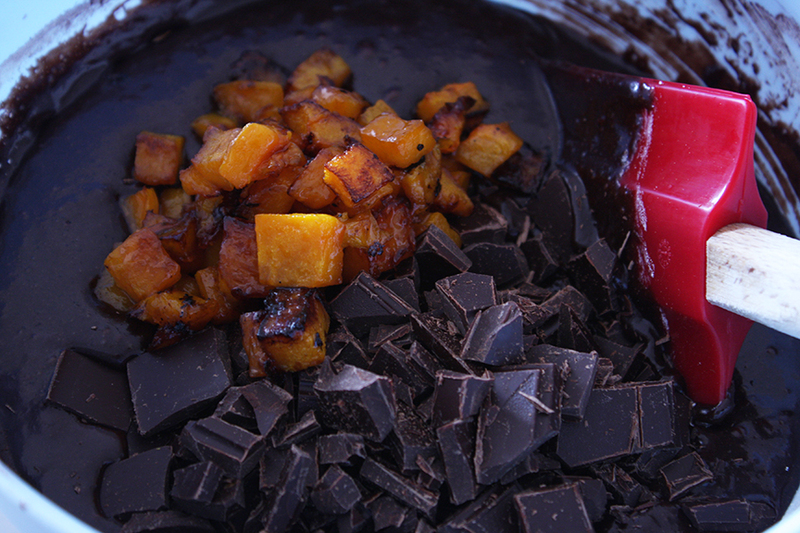 Only then are these cubes of sweet nutty squash along with shards of super dark chocolate (of course) folded into thick, almost black brownie batter. Listen, I’m going all the way here, crackly topping and all. See step-by-step photo instructions of this recipe on the Facebook page. Preheat the oven to 400F (200C). Line a cookie sheet with parchment paper. Add squash, butter and brown sugar to the cookie sheet. Toss until squash is coated in the sugar and butter. Bake squash for 10m. Remove from oven and flip the squash. Bake for another 5-10m until squash is soft and caramelized. Remove from oven and set aside. Preheat oven to 325F (162C). Lightly grease a brownie tin or 9 x 13 casserole dish with butter. Line the pan with parchment paper, leaving a bit of overhang on the sides. This will help you lift the entire brownie out of the pan and onto a cutting board for simple carving. In a large bowl, whisk together the cocoa, sugar and salt. Add the eggs and whisk until smooth. Add the butter and, again, whisk until smooth. Add the flour and baking powder. Whisk until the batter thickens. 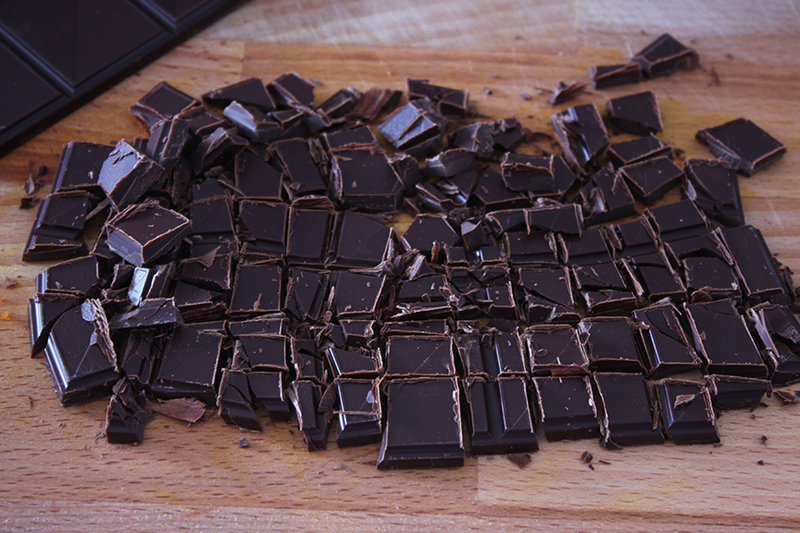 Switch to a spatula and gently fold in the chocolate and 3/4 of the squash. I say gently because we want to keep those yummy pieces of squash in cube form instead of as mashed streaks lost in a sea of brownie. Again, gently spread the batter evenly into your pan. Sprinkle the remaining squash on top of the brownie. Bake for 45m to 50m until top is cracked, sides have slightly pulled away from the pan and an inserted toothpick (or meat thermometer as I do) reveals a baked but still moist center. Remember, there are chocolate chunks in there which could give you a false negative so test in a couple places if you aren’t sure.